The most important person you care for as a nurse is yourself. Those called to healthcare often have the drive to give, to empathize, and to care for others. Given all that, it’s easy to forget about self-care as you plunge into a demanding nursing schedule. This has consequences. Nurse burnout is real, and it’s a problem. However, stress can strike even before a future RN gets to their pinning ceremony. 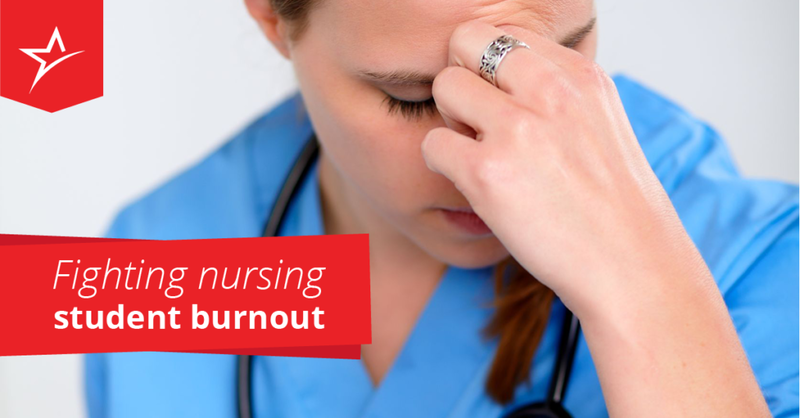 Nursing student burnout is also real and students need to guard against stress. Nursing students cope with stress in a variety of ways, and many of their coping mechanisms are constructive. However, one of the most common coping mechanisms for the stresses of nursing school leads directly to burnout: avoidance coping. Avoiding problems is easy. Putting off assignments, leaving things for later, or assuming your future self will take care of everything is easy. However, according to a 2010 study, avoidance coping is the strongest predictor of burnout in nursing students. This isn’t exactly surprising. By avoiding problems students just add to the pile of issues that can potentially leave them in states of distress. Burnout treatments are easy to talk about but hard to implement. The best way to deal with burnout is through planning. Coursework can often look daunting or unreasonable at the beginning. Reading a whole book, memorizing a whole category of medications, or internalizing whole chapters worth of new terminology can look impossible. It’s no wonder many students deal with the challenge by ignoring it. A realistic study plan for healthcare students that breaks down individual bits of coursework into reasonable chunks can bring the challenge into focus and help mitigate the stress that leads to avoidance. Making sure your schedule is realistic, knowing how much you can actually get done in a given day, and budgeting your time with friends, family, or other people in your support system can stop burnout before it starts. If it does set in, though, there are ways to bounce back. Taking a break from a busy schedule, making time to yourself, and separating yourself from stressors are all effective ways to treat burnout. However, it’s important for healthcare students to maintain proper schedules and boundaries upon their return to school. If they don’t, burnout could very well set in again. Being diligent about rest and allocating time for self-care can be hard for a working nurse, but sometimes it’s even harder for a student. Nursing students often want to get done with school as quickly as possible so they can put themselves on the job market. Effectively fighting nursing student burnout means pushing back on common student urges to constantly accelerate. Assigning time for self-care (which is very different than simply avoiding work) is crucial for students to stay active. However, difficult as it may be, it’s important to have structured and predictable periods of relaxation. Developing a work-life balance while studying healthcare is necessary if you want to flourish long term as a nurse. You can’t care for others if your internal resources are depleted. Take time for yourself as a student. Hopefully you’ll stop burnout before it starts. Check out the Nurse Burnout Prevention Matrix for over 100 nursing burnout interventions. Let’s hear from you! 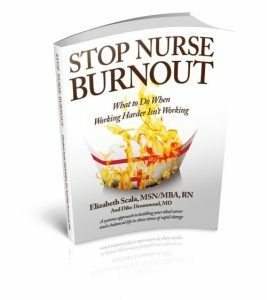 Have you ever experienced nursing student burnout? What did you do to avoid or cope with it? What can you share with our readers to help them put a stop to student burnout? When I was teaching nursing students, so many were single moms, working and going to school. Such a different experience than mine where I was only studying nursing and that was daunting enough! Educating and supporting nursing students in self care is essential for them, the profession and our care recipients. As a thought leader Elizabeth, you are naming the elephant in the room and telling us all how to journey with it. Thanks so much! Wow. Padma, thank you for bringing this point to our attention. You make an excellent and very valid point!! I had not thought of that before. Thank you. So glad that you enjoyed the post. Much appreciated!